The Cabin Branch Quilters (CBQ) quilting guild was founded in 1989 by Paula Golden to provide a focus for quilting in Prince William County, Virginia. Through active recruitment and widespread publicity, we have grown to over 150 members and welcome new members who are interested in quilting. We have a wide range of experienced and new quilters which provide for an exciting membership. We meet at the Lake Ridge Baptist Church in Woodbridge, the fourth Monday of each month, at 7:00 pm. CBQ sponsors educational activities including lectures, workshops and demonstrations. 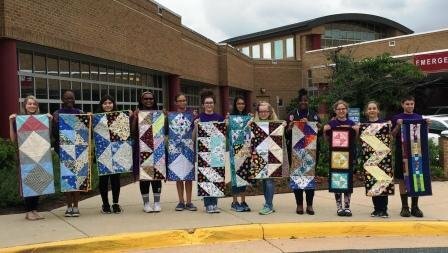 The guild also serves the community by making lap quilts for the ACTS Turning Point Shelter for abused women and children in Prince William County, and NICU Quilts for sick children in local area hospitals. Partial funding has been provided by the Prince William County. If you would like, visit our next meeting and perhaps consider joining the guild.